@Knurek if you are around, do you happen to know how the Atomiswave game contents were decrypted? Trying to examine the game Hokuto no Ken, and I was only able to get manual editor dumps with the game running to see that it uses both Yamaha AICA 4-bit ADPCM and PCM RAW (Little Endian) which seem interchangeable even in typical voice sfx. The BGM portions are missing (can only find a very small portion of the character select in the 4th FARC group extraction). Hello guys, can anyone tell me why amiga.joshw.info isn't accessible? @Guest Check the first page of this thread. It's been on hiatus for awhile. can anyone rip the mega man 11 demo for ps4, i'm wondering what it uses, at9? @Despair have you done the same to Forbidden Memories? I'm a huge fan of this series soundtrack btw, it's nice to find someone who likes it aswell. I take it this is in reply to my Duelists of the Roses post? 3. Metropolis 1 & Area Selection appear to be the same track, with different lengths in that youtube playlist. Both Forbidden Ruins are the same and Simon & the Desert At Night themes are the same as well. 4. I recall a track or 2 missing some sound at the beginning that's in the track on youtube playlist. No idea which is incorrect here. 5. The PSF lengths are wrong, so I had to change them with vgmtoolbox's xSF tag editor (see my thread here). I matched them to the lengths in the youtube playlist. Anyway, here's the track list as it looks right now. I'll get around to playing it eventually and verifying everything, but this should do for now. 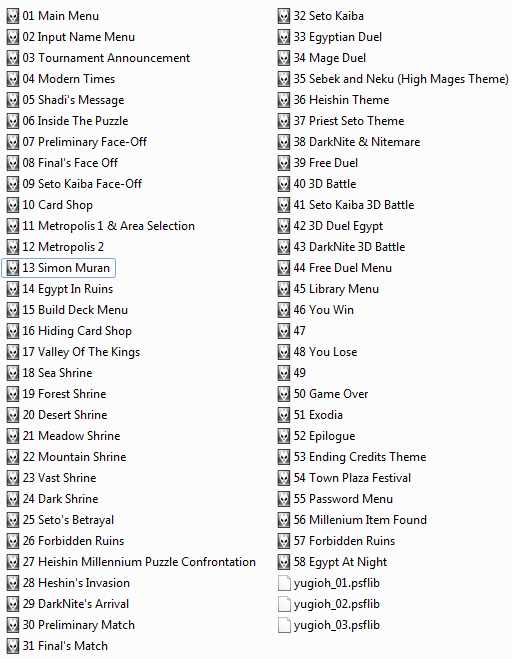 Actually, the only reason I checked it out in the first place is because I heard that themes from Duelists were remixed from Memories - I wasn't impressed with those, but I like the Shrine and Egypt Duel themes, so I guess it worked out anyway. Looking for a soundtrack rip of For Honor. I'm using droidsound-e so a rip of the PS4 version would be fine. I have it on PC, so I can rip the soundtrack if someone has the tools for it. A few years ago, it seems there was some files, what the reason to make it inaccessible recent years?